DUI charges can have a number of consequences in addition to those contained in a sentence upon conviction. Simply being charged with DUI in Arizona can have a devastating effect on your driver’s license. A conviction can cause you insurance rates to sky rocket and can affect employment. At Leonardo Law Offices, we take a comprehensive approach to DUI cases. We are a results-oriented law firm, and getting the best results includes dealing with any negative consequences our client may face. We attack a DUI case from every angle, but we also do our best to minimize the impact of a DUI on a client’s life. When we are retained in a DUI case, our services include representation in front of the MVD to challenge any license suspension. What constitutes driving under the influence (DUI) in Arizona? 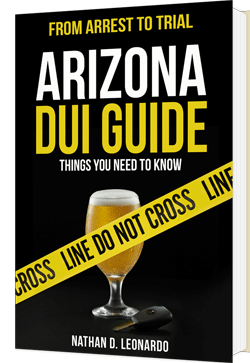 In Arizona, it is illegal to drive or be in actual physical control of a vehicle while you either: (1) are impaired to the slightest degree by alcohol, drugs, or a combination of alcohol or drugs, or (2) have a BAC (blood or breath alcohol concentration) of at least .08% or have any illegal drug or its metabolite in your system within two hours of driving or being in actual physical control of a vehicle. Yes, in Arizona a DUI charge can be either a misdemeanor or a felony depending on the circumstances. Either way, any DUI conviction results in a criminal record. Is it possible to get a DUI if you aren’t driving? Yes, you can charged with DUI even if you’re just parked in a car. This can be considered “actual physical control,” whether you are parked on the street, in a parking lot, or even in your own driveway. What happens to my driver’s license if I get charged with DUI? If you refuse a breath or blood test, your license can be suspended for one year. If you agree to take a breath or blood test and the result shows that you are over the legal limit, then your license can be suspended for 90 days. If you’ve had prior DUI arrests, your license could be suspended even longer or revoked. Is there any way to challenge the suspension of my driver’s license if I’m charged with DUI? Yes, you can request a hearing to contest the suspension with the Motor Vehicle Division (MVD). Your hearing request must be submitted within 15 days of receiving the notice of suspension, which is often given to you by the police when you are arrested for DUI. Yes, DUI charges can be beat. In fact, we have a long list of DUI cases that we have won. In every one of those cases, the police claimed that our client was guilty because of a breath or blood test result showing that our client was over the legal limit or had drugs in his or her system. Of course, whether you can beat a DUI charge depends a lot on the specific facts and circumstances or your case. What are the penalties for a DUI? Will I have to go to jail? The penalties for a DUI conviction in Arizona depend on the type of DUI conviction and whether a person has committed prior offenses. You can find a detailed list of Arizona DUI penalties by clicking here, but even a first-time misdemeanor DUI carries a mandatory jail sentence in Arizona. Court is a formal place with a lot of rules. It is also a very busy place, so court appearances can involve a lot of waiting. Many people who go to their initial court date by themselves quickly realize that they need professional help. Courts also move at a different pace than many people are used to. It can take many months and repeated court dates before a DUI case is resolved. Your first court date is usually an arraignment. There are many people scheduled to be arraigned at the same time, so you will typically need to wait awhile for your case to be called. The judge will make sure you understand the charges, enter a plea of not guilty on your behalf, tell you that if you fail to appear for future court dates the case could proceed in your absence, and then give you another court date. From there, various hearings are typically scheduled every month or so until the case is resolved. If you hire an attorney in a misdemeanor DUI case, your attorney can appear for you so you don’t have to take time out off of work to attend court hearings. There are usually certain hearings that you will need to attend and your attorney should let you know about these. In felony cases, you generally must attend every court date with your lawyer. DUI charges carry serious penalties that can affect you far into the future. Most people are not familiar with the rules of criminal procedure and evidence to handle these cases themselves. Moreover, DUI law is a specialized and very technical area of criminal law that even many lawyers are not well-equipped to deal with. An experienced DUI lawyer can spot legal issues that might result in a better plea offer, suppression of evidence, or even the dismissal of your case. A skilled DUI trial lawyer could be able to win your case at trial. If you know that you want to plead guilty (essentially convict yourself) and accept whatever consequences the prosecutor or the judge wants to give you, then hiring a lawyer may not be of value to you. However, if you want the best possible outcome in order to minimize the negative consequences a DUI conviction can have in your life, you should seriously consider hiring a DUI lawyer. If you’re still not sure, it makes sense to at least consult with a DUI lawyer before deciding how to proceed with your case. What about a public defender for my DUI? You may qualify for a public defender if you demonstrate to the court that you are indigent. There is usually still some sort of fee you must pay to the court to offset the cost of the public defender, but it is significantly less than hiring your own attorney. Public defenders and/or attorneys who accept court appointments have different levels of experience, but all of them handle a very high number of cases. They cannot afford to spend a lot of time on each case, so they are forced to triage the cases, deciding which ones they think are worth putting more work into and which are not. They may also be difficult to communicate with because they are so busy. A court appointed attorney is certainly better than no attorney, but their representation is also limited. Generally these attorneys will not represent you in front of the MVD to challenge your license suspension. If you are convicted of DUI, they will generally not assist you in providing proof to the court that you completed the requirements of your sentence, file a motion for early termination of probation, or file a motion to set aside your conviction. A private, full-service DUI lawyer should include all of these things with their representation. A private lawyer depends on satisfied clients to stay in business, so his or her interests are better aligned with your own. A private lawyer should be also accessible and willing to advise you about any concern you might have throughout the process. How to a choose a DUI lawyer? You should take some time to do a little research before hiring a DUI lawyer. Search online and ask around to find a lawyer with a good reputation. Make sure they have experience handling DUI cases and a history of achieving good results. It’s probably best to talk to two or three lawyers so you can decide who you’re most comfortable with. Although price is an important consideration, hiring the cheapest lawyer you can find is usually not the best choice. The bottom line is that it’s difficult for most people who are not involved in the legal system to distinguish a good lawyer from a bad one. It takes some legwork. To help you with this process, you might want to take a look at this free consumer guide to hiring the right DUI lawyer. Call our experienced Tucson DUI lawyer for a free case assessment over the phone or in person. "Nathan Leonardo represented me throughout my DUI experience including trial. I could not have hired a better attorney! His fees were reasonable and he advised me about the process from beginning to end. Having never had any legal issues in the past, this was a traumatic experience for me. Being a healthcare professional, I was worried about the impact on my license and future career. Mr. Leonardo walked me through all the steps and utilized a case portal so I had access to all documentation and could follow along with progress made during the case. During trial, Mr. Leonardo's aggressive representation was sufficient to prove my innocence! After a year-long ordeal of hearings, the case was dismissed. I cannot thank him enough!!!"